From today onwards you are going to see new features in Youtube. The site has rearranged interface to provide much cleaner and elegant look and feel. The main page now shows a new section which displays the videos which are watched now by other users. Videos being watched now section is small animation which keep rotating image of the video along with length of the play. The embed video interface is moved down the video player. Now the right side of vide player displays online status of the user who uploaded along with the list of other video the same user shared or uploaded. 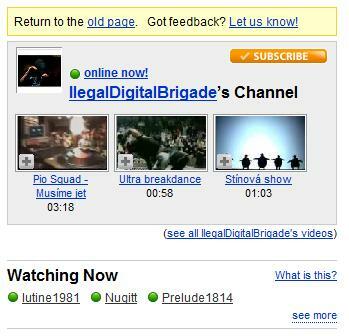 Just below a list of users who are currently watching this video is also shown. No need to consider this as another concern of privacy from Google. There is an option which enables each user to turn or off sharing information on what they are watching now. While embedding the videos in your blogs or web site you can choose whether to display related videos or not. Also the text links which are used for saving the video as favorite, sharing the video and reporting as abuse are given a facelift with new icons.